Bay Cliff Village is an intimate oceanside community set in California's beautiful Orange County. This quiet enclave is ideal for older homebuyers who value location over community amenities. Homes are a short walk from the ocean and within minutes of recreations like the Shorecliffs Golf Course. 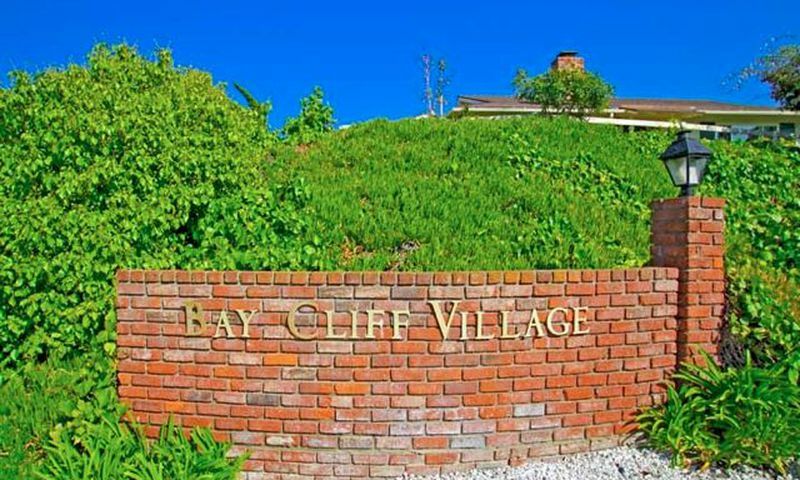 Located in San Clemente, Bay Cliff Village boasts a prime location and plenty of quaint charm. The community was built by Douglas Construction between 1962 and 1963 with just 28 single-family homes and a small clubhouse. It is an age-restricted community which welcomes residents aged 55 or better with well-established landscaping and lovely streetscapes. Bay Cliff Village has a small clubhouse where residents can mingle with neighbors and meet new friends. A multi-purpose room hosts community gatherings while, outdoors, residents can take in the ocean air with the walking and biking trails that weave around the community's parks. It is adjacent to the Shorecliffs Golf Club, which has an 18-hole championship course featuring challenging play and lush scenery. Proximity to the ocean is typically considered Bay Cliff Village's most attractive amenity. The beautiful beach offers clear blue water, sandy shores and gorgeous weather. Residents can enjoy swimming, sunbathing and a variety of water-based activities just a short walk from home. Active adult residents in Bay Cliff Village enjoy beach living just steps from the ocean. While there is a small clubhouse for gatherings, residents choose the community more for its oceanside appeal and low-maintenance homes. The community is small, which makes it easy for residents to get to know their neighbors. With only 28 single-family homes, Bay Cliff Village is a very small, oceanside community. Homes were built between 1962 and 1963 by Douglas Construction with designs planned for low-maintenance living. Resale homes today often feature lush, mature landscaping and various owner-chosen upgrades. Homes were originally built in two different floor plans. Plan A has a 1,016 square-foot layout with one bedroom and one bathroom. Though this model is rarely available as a resale, its smaller size tends to make it a less expensive option. Resale homes built with the Plan B floor plan are more common to find on the market. They are larger homes with 1,266 square-foot floor plans, two bedrooms and two bathrooms. Both models have one-car garages. Bay Cliff Village is midway between Los Angeles and San Diego, in the coastal city of San Clemente, California. This ideal location is a prime location for vacationers and retirees alike. It features gorgeous beaches, charming neighborhoods and quaint local attractions. The community is within minutes of shopping, dining and daily conveniences like banks and the San Clemente DMV. There is also a local movie theater, coffee shops and the San Gorgonio Park. Outside of San Clemente, Bay Cliff Village residents can explore many other popular California destinations. Dana Point and Laguna Beach are just up the Pacific Coast Highway. Both Irvine and Newport Beach are about 40 minutes north of the community, while Oceanside is just 30 minutes south. Los Angeles and San Diego are each about an hour's drive, and the San Bernardino National Forest is within 90 minutes. Check back soon for more information on the lifestyle in Bay Cliff Village. Homes were built between 1962 and 1963 by Douglas Construction with designs planned for low-maintenance living. Resale homes today often feature lush, mature landscaping and various owner-chosen upgrades. Homes were originally built in two different floor plans. Plan A has a 1,016 square-foot layout with one bedroom and one bathroom. Though this model is rarely available as a resale, its smaller size tends to make it a less expensive option. Resale homes built with the Plan B floor plan are more common to find on the market. They are larger homes with 1,266 square-foot floor plans, two bedrooms and two bathrooms. Both models have one-car garages. I moved in Bay Cliff Village East in 1998 solely because of its close proximity to the ocean. The bad thing: living in a duplex. The good thing: having a 6foot privacy fence between the two units. Douglass who starting building Bay Cliff in 1962 obviously knew how important it was to have privacy in such a small area. Lots of grassy area makes it a very pleasant place to live. 55places.com is not affiliated with the developer(s) or homeowners association of Bay Cliff Village. The information you submit is distributed to a 55places.com Partner Agent, who is a licensed real estate agent. The information regarding Bay Cliff Village has not been verified or approved by the developer or homeowners association. Please verify all information prior to purchasing. 55places.com is not responsible for any errors regarding the information displayed on this website.